James Roland can still recall the day his middle school teacher back in Pineville, Louisiana, asked each student to write down what they wanted to do when they grew up. At the time, he was surprised to be told that his answer wasn’t sufficient. But many years later, Roland has proven that not only was it a worthy aspiration, it was a bit prophetic. Roland joined Emory in 2000 to work with the Barkley Forum Center for Debate Education, the University’s award-winning intercollegiate debate program that supports competitive debate, community outreach and campus engagement activities. More recently, the Barkley Forum has stepped into a leadership role on campus, helping model civil discourse by moderating public campus dialogues and debates on pressing topics and offering student advocacy trainings. 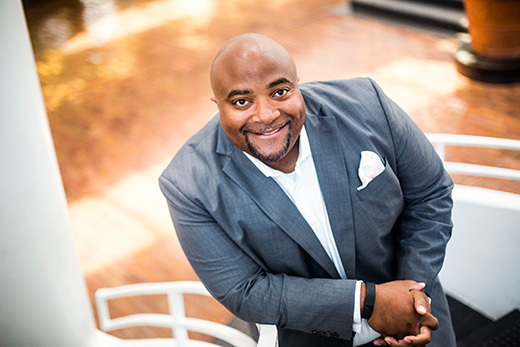 Roland has also taken on a new, expanded role as senior director of civic and community engagement for Campus Life. In addition to his work with the Barkley Forum, he also oversees programs such as Volunteer Emory, Graduation Generation, the Community Building and Social Change Fellows Program, and the Atlanta Urban Debate League, which provides debate programs to students in Atlanta public schools. This spring, Roland — formerly a nationally ranked collegiate debater himself — used his skills with oratory and civic engagement to moderate Emory’s Racial Justice Retreat, part of an ongoing community-wide dialogue arising from demands raised last fall by the Black Students at Emory movement. As the Barkley Forum leads an intensive series of debate camps for elementary, middle school and high school students this summer, projected to bring some 400 students to campus, Emory Report caught up with Roland to talk about how he became captivated with the power of words. How did you discover debate? I was born and raised in Pineville, Louisiana, surrounded by people who valued a sense of community and hard work. It was a very rich place where I learned a lot about myself and others — family, friends and teachers in the community who functioned as family. The middle school debate team gave a presentation and I realized that maybe debate was not the world’s worst thing. It offered a place to talk and people who would listen to me. So I joined the debate program, which was led by an amazing teacher, Mrs. North. She was so gracious, open, kind and willing to give me an opportunity to test out my voice, discover who I was. Was your family surprised to see you pursue debate? Not really. I come from a long line of folks who’ve been involved in the ministry — parents, grandparents, a great-grandfather, even uncles. They figured I would do something that involved talking. The church gave me a place to start using my voice, witnessing how people negotiate difference and deal with pain, hurt and joy. It’s been a very rich part of my life. Through ministry, they demonstrated that the most meaningful life you can live is a life of service. The opportunities I’ve been afforded at Emory provide some of those same opportunities to do meaningful work, to help the students of Emory but also greater Atlanta and the world at large. It allows for those missions to be aligned. I feel extremely blessed. Why is it important for young people to be exposed to debate? Debate gives you an opportunity to develop a set of skills that allows you to take ownership of your learning, including critical listening skills, seeing things outside your own scope of view, research and note-taking, defining an idea and fleshing it out for the sake of getting to the best idea. Those are things people use to negotiate throughout the world. Being able to look at things from multiple perspectives gave me a chance to expand my own horizons. Developing your own voice allows you to be fully human. It means that even if we disagree, we can do it in a productive and civil way. How did you come to Emory? I majored in political science and communications at Southern Illinois University, where I participated in debate throughout college. I had the opportunity to debate against Emory students and meet Melissa Wade, who retired from Emory last year after serving as executive director of the Barkley Forum for the past 43 years. Through Emory, I knew that Melissa was instrumental in helping found the Urban Debate League, a network of high school policy debate teams from urban high schools throughout the U.S. It all started at Emory, and since then we’ve seen some 40,000 students go through the program. Melissa saw an opportunity to invite me to come to Emory in 2000 and start teaching at summer debate camps. Fifteen years later, I’m still here. What is the goal of the summer debate camps? To expose students to the skills that help make them better as students, as debaters, and as human beings. Teaching them how to listen, to have productive and effective conversations with others. Hearing things outside their worldview is extremely important. Our camps also give them a chance to acclimate themselves to a college campus. It’s great for high school students to see themselves here. We’ve had a number of students who’ve come to Emory through that first exposure to camp. It’s also an opportunity for us to pay it forward too, carrying the torch for what debate can be and how it can impact society. After all these years, what keeps you grounded in your work? Barkley Forum has always provided a sense of family and a sense of community. It is multi-generational and extends far beyond the walls of Emory. That’s a powerful connection. Once you’re part of the Barkley Forum, you don’t want to lose that connection. I don’t know if everyone finds that, being part of a group that serves as a conduit to help make the world a better place. Emory has given me that opportunity. I’m looking forward to building that same sense of family in my new role.